A medium close-up that captures the complexity of the artist. Set amid a swirl of blues and greens, the vibrant orange of Van Gogh’s hair and the warmth of his skin tones create a striking contrast. "Received the paintings yesterday. Just fabulous! Thank you, off to the framers today. An early Christmas present for myself. 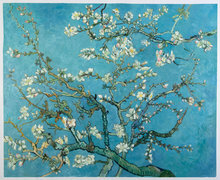 Robyn"
Your own Van Gogh painting will look and feel like the original. 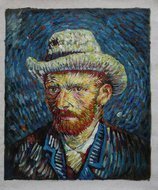 Here at the Van Gogh Studio, each of our paintings is hand painted by Dutch and wolrd artists who have studied Van Gogh’s techniques as part of their creative practise. Their training has emphasised brush stroke, colour mixing, ambience and rhythm of application. 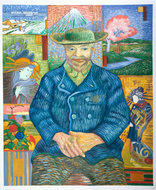 We are based in Amsterdam near the Van Gogh Museum itself. This gives our artists unrivalled access to the continual study and deep understanding of the great master’s techniques. In maintaining this knowledge, we are contributing to the preservation of the country’s rich culture. 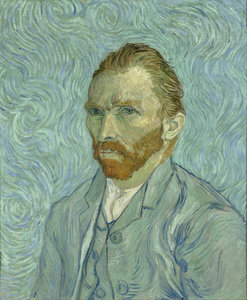 This painting is considered a particularly important work in Van Gogh’s oeuvre, given that many historians believe it to be his final self-portrait. It was painted towards the end of his self-imposed defection to an asylum in Saint-Rémy-de-Provence. 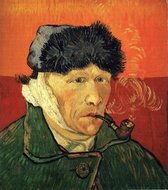 He’d sought refuge there after his mental struggles had come to a head with his notorious ear cutting episode. The relative calm and order of his stay resulted in some of his greatest masterpieces, of which Self-Portrait is certainly one. 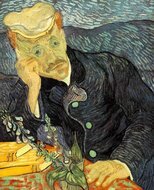 In a letter Van Gogh wrote to his brother Theo, he wrote of the painting: "You will need to study the picture for a time. I hope you will notice that my facial expressions have become much calmer, although my eyes have the same insecure look as before, or so it appears to me." Some art historians have contended that the dissolving colours and hallucinogenic patterns depict the mental, physical and emotional strain under which he remained.